Photo opportunity: 100 people unfurling banner saying ‘Break the chains of debt’ in Birmingham Cathedral grounds, Colmore Row, Birmingham B3 2QB from 14:15 to 14:45 on Saturday 29 September. On 29 September the charity Jubilee Debt Campaign will be holding an event in Birmingham to celebrate the 20th anniversary of the largest ever protest in Birmingham and to call for measures to tackle unjust debt in the UK and around the world. The event coincides with the start of the Conservative Party Conference. 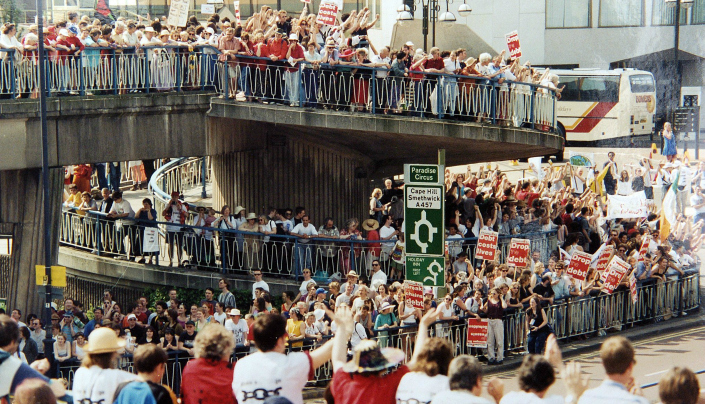 In 1998, 70,000 people protested outside the G8 summit in Birmingham, calling for the debts of 52 impoverished countries to be cancelled as a way of celebrating the millennium. This is believed to be the largest political protest ever held in Birmingham. Following the campaign, $130 billion of debt has now been cancelled for 36 countries, helping to tackle poverty and improve access to healthcare and education in many of the countries concerned. However, debts are on the rise again, with average debt payments by developing countries rising by 60% in the last three years, after a boom in lending caused by low interest rates in the US, UK and Europe. The campaigning group has also begun work on the growing dept trap faced by families and communities across the UK. As part of the End the Debt Trap campaign, it is calling on the government to cap on the cost of loans, credit cards and other debts in order to rein in rip-off lending across the UK. Speakers at the event include renowned economist Ann Pettifor – who predicted the global financial crisis which began 10 years ago this month, Sarah-Jayne Clifton, Director of Jubilee Debt Campaign, Atallah FitzGibbon, Global Advocacy Manager at Birmingham-based Islamic Relief Worldwide and Nick Dearden, Director of campaign group Global Justice Now. As part of the event, over 100 campaigners will gather at the Cathedral grounds, Colmore Row, Birmingham B3 2QB at 14:15 to unfurl a banner saying ‘Break the chains of debt’. The event is from 10:15 – 17:00 at the Birmingham & Midland Institute, 9 Margaret Street, Birmingham, B3 3BS. Tickets are available from here.